With more than 20 years in the shower door industry, we have installed custom frameless shower doors in some of the most incredible homes in the New Jersey and Pennsylvania area. We offer a larger variety of shower options, which helps us guarantee that we can find a solution that fits both your bathroom and your budget. Modern bathrooms are all about openness, fluidity and flow. Open designs attempt to bring together different elements such as decorative tile, contemporary bath fixtures, and sprawling vanities. Traditional shower doors, with their hard lines and glaring frames, tend to work against that aesthetic by creating closed, defined spaces; A frameless glass shower door, on the other hand, helps to create a more open, seamless and contemporary space. Whether you’re a builder, contractor or homeowner, if you’re looking for a custom Frameless Glass Shower Door or Enclosure we are your shower door experts! When you call Creative Shower Doors, you will be working with an experienced installer – NOT a professional sales person. We gladly offer free, in-home, hassle free estimates with quick responses and recommended options to suit your needs. 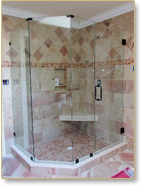 Call today and see how Creative Shower Doors can help you live in luxury, without breaking your bank.